Happy Thanksgiving week! Yes, I like to extend this holiday of thanks to a 7 glorious days of gluttony. In honor of the holiday, I will be posting three of my favorite Thanksgiving recipes for your mouthwatering pleasure. These recipes are simple, yummilicious, and are bound to impress your family members, who will think you spent hours toiling away in your tiny apartment kitchen (oh wait, that’s just me). I hope some of these dishes will end up on your table this Thursday! 1. Preheat oven to 375 degrees. 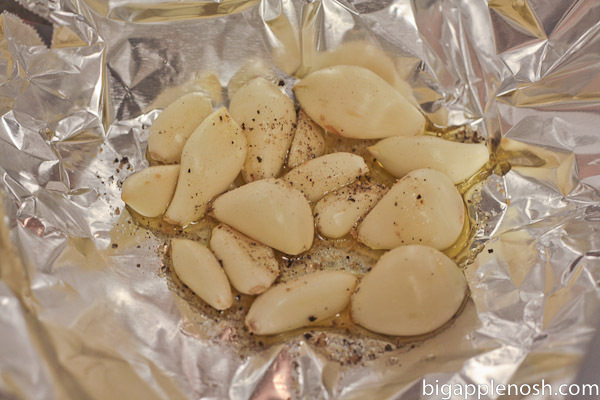 Place peeled cloves from garlic head onto foil, drizzle with olive oil and salt and pepper. Roast in preheated oven for 35 minutes. 2. (I prefer skins-on, but if you like skinless mashed potatoes, you’ll want to peel them before this step). Boil large pot of salted water. 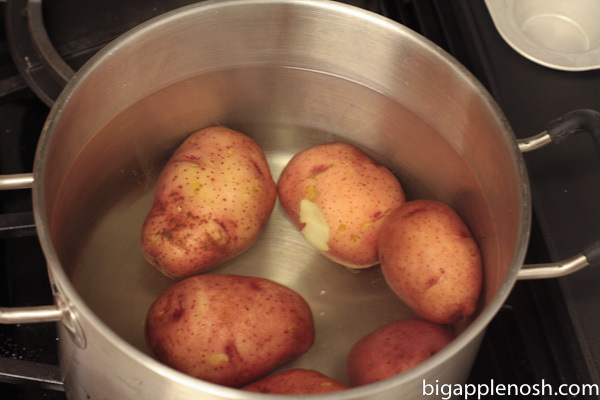 Add potatoes to boiling water and cook until tender, approximately 22 minutes (more for larger potatoes). 3. When tender, drain potatoes. 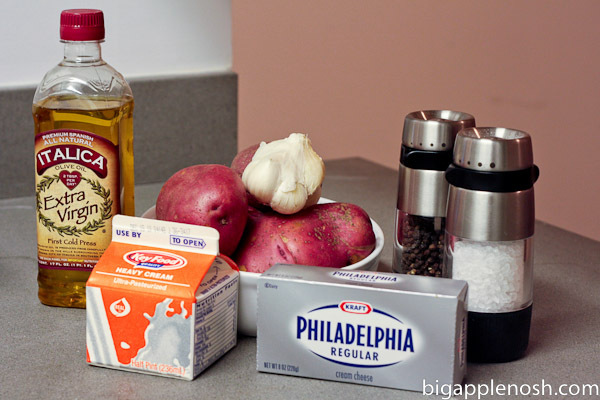 Return potatoes to pot and add cream. Mash until combined. 4. 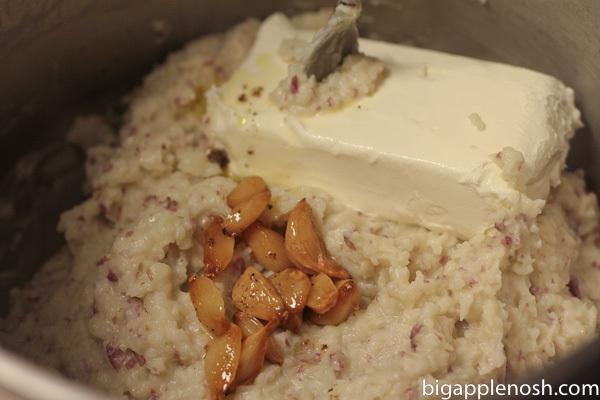 Add cream cheese, garlic powder, and roasted garlic and continue mashing till well-incorporated. 5. Season with salt and pepper and garnish with chives, if desired. Sure, you might need some Altoids after this, but I think it’s worth it, don’t you? 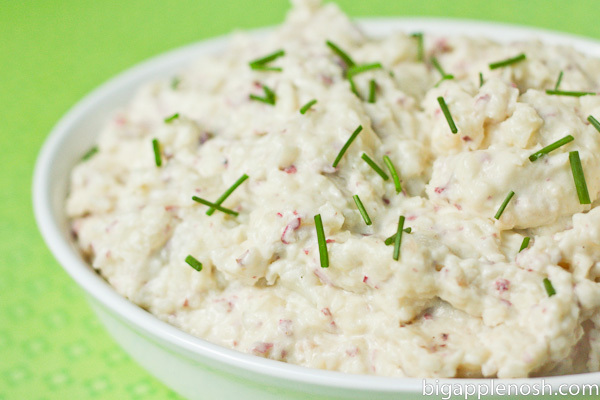 What are your favorite mashed potato add-ins? 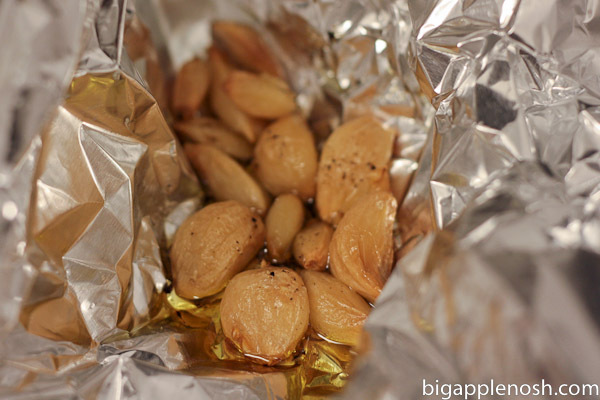 love roasted garlic! sometimes I just add a bit of salt to it and eat it right out of the foil. yowzas! 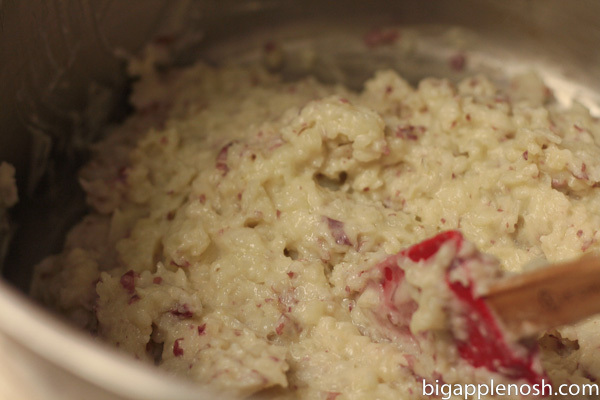 this potato mash looks delish!! ooh, i love the roasted garlic! and i never thought of cream cheese. this looks delicious! I make something really similar to this, but add in feta cheese. Try it sometime!! so yum. 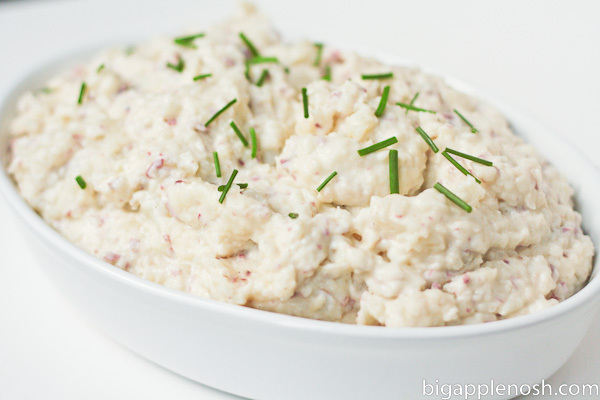 Cream cheese is the secret to Pioneer Woman's creamy mashed potatoes too. I can't wait to make these for thanksgiving. But I might have to diet for a few days first. Can I say that whenever I make mashed potatoes they never come out well. Maybe I need to try your recipe. OMG, that looks amazing!! Love the roasted garlic! Oh wow, that cream cheese, haha. The boy's absolutely favorite thing in the world is mashed potatoes, and I tried to make it once but they were only…eh. I'll have to try these out and see how he likes it! Thanks! First of all, that's a fantastic photograph of mashed potatoes. And that's not easy to do. Secondly, I would like to eat those now, please. Well thanksgiving is over, but I am thinking I need to make these potatoes and I am thinking tonight, look so good. A really good answer, full of raynoialitt! Big Apple Nosh: NYC Food Blog | New York | Food | Restaurants | Recipes | Reviews | Thanksgiving Recipe Round-Up!